Not all dinosaurs went extinct 65 million years ago. One group survived, and we see their descendants every day. We call them birds. Pterodactyl Great blue heron catching prize fish. Time stood still that day in the secluded cove. The rumbling of a lumbering Diplodocus moving towards the tallest stand of trees echoed over the ridge. A school of Leedsichthys searched for plankton in the watery depths, swishing this way and that. Overhead, a flock of Archaeopteryx flapped and wheeled, warming their wings in the late day sunlight. A lone Pterosaur spied a prize fish and dove towards the water, and in the instant it surfaced with the fish, time stopped standing still. The fisherman really did bellow that quote in the channel. At the time it happened, I was looking down in the cockpit of the kayak, stowing gear. The moment I heard his shouting, I knew it could only mean one thing: a great blue heron flying nearby. I rendered the photo in B&W to give it a more ancient look, and besides – they didn’t have color film back when pterodactyls ruled the skies. Thanks to Michelle W. and WordPress for the Daily Prompt nudge. Thanks also to Cee Neuner for the Black and White Photo Challenge: Animals prompt, and to Ed Prescott for the Sunday Stills: Creepy prompt. Posted on September 24, 2013, in ardea herodias, Birds, Black and White Photo Challenge, daily prompt, Fine art, Great Blue Heron, Nature, Photography, Photography challenge, postaday, Sunday Stills, Weekly Photo Challenge, Wildlife Photography and tagged ardea herodias, great blue heron, heron, postaday. Bookmark the permalink. 21 Comments. Stunning black and white. Thanks for playing! You’re welcome, and thank you for hosting your challenge. Oh my!!! It is incredible!!! It really looks like something super big and old like a Pterodactyl! May be they are somehow related? I agree with you! Great blue herons are beings of extraordinary beauty and grace, IMO, but there are moments, such as this photo, when they seem ancient and related to the prehistoric birds like the pterodactyl. Thanks for commenting! Beauté d’un éclair de lumière, dans la surprise de cette prise ! Qu’est-ce un prize fish ? Par avance merci beaucoup. Thank you! The prize fish that the heron caught is a Northern Pike. 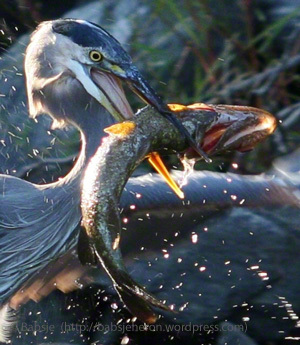 The heron is beautiful, the Northern Pike is not so pretty. Very nice capture, like the black and white look too. Thank you, I’m glad you liked this onr in B&W and appreciate you commenting here! Totally awesome the way you juxtaposed the past with the present. It felt like I was there!